the recycled cardi project – nearly there.. just need to sew up and sort out something for the collar..
bluey-browny socks – I started them in the hope of finishing in time for that winter festival thingy.. but didn’t (in my defence I did manage a few things!) so maybe be done in time for next year..
blue and turquoise jumper for son – part of my goals for 2010 – he wants blue – I want to see him in a different colour for a change..we compromised. blue and green homespun jumper – so far only dyed some of the wool. 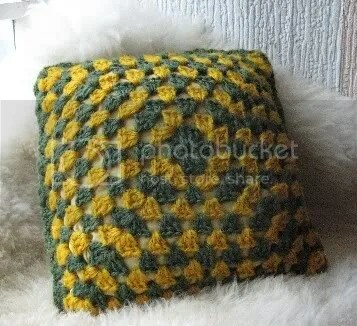 lets get ready to scrumble – still enjoying it – but it’s not for when you have a lack of sleep addled brain..
red and yellow cushion – not sure of the design yet – but something cheery and cosy for the living room. Nothing of any import to report today.. I didn’t achieve much, just ambled through it. People seem to gauge other people by what they do – and by this they mean for a job. I’m fortunate enough to be able to stay at home with my son, who is disabled, and educate him, and fit the rest of life around that. Then a break, and I check the animals, taking beet shreds to the sheep, who attempt to trample me, in a loving way!, to get to the food. Collect eggs, check on hen with crusty looking eye.. check everyone else looks ok. Attempt and fail to catch said chicken. Still, it’s exercise. Back to home ed, and we walk to bus stop, catch bus, walk to swimming pool, swim, lunch and home. Son reads his library book, I go chicken catching again. Sneak up on chicken on blind side and make captive, bathe eye.. chicken opens eye sees me and gives me hard stare. Alvin the cockerel was giving me what for too, but he doesn’t do more than cluck a lot. Feed sheep again, then inside to ponder what we shall eat for tea – decide it will be based on eggs and the hog’s pudding I bought at the butchers. Prep half a pig’s head for cooking, inspect the latest onion skin dyeing (fifth dip in the pot and still a good yellow), ponder the next dye pot scheme, wash some fleece and start dyeing it. Now, I’m writing this, then shall eat the fry up for tea (hogs pudding, poached eggs, mushrooms and beans – himself is cooking), before settling down in front of fire for some crochet and knitting. So – how was your day? 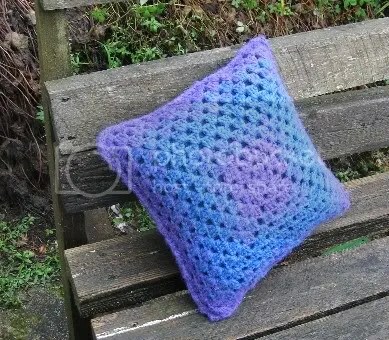 Talking of blues, I finished this blue and purple cushion yesterday – my latest interest is the blending of colours, at carding or plying stages..
Devon Closewool wool, home dyed and spun. There’s been a lot of indoor time lately. Could have spent it on DIY, but always good to indulge in a little colour therapy. 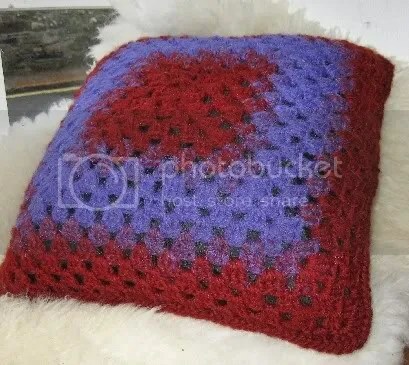 A red and purple crocheted cushion – our own wool, we dyed and carded it together to blend from one to the other. Quite pleased with how it came out. Another cushion, this time from the fleece from the ram we borrow (no we did not cut it off the ram!, they gave us the fleece) made into a present. A bit more garish than I wanted, but I am still pleased with the results. 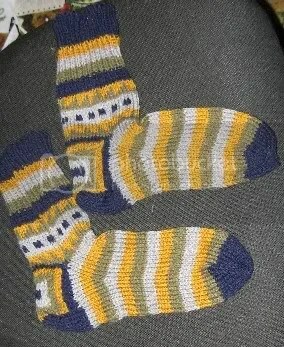 socks for himself. I had promised myself I wouldn’t do more than one colour in the round, but somehow ended up doing this. Made up the pattern as I went along. The heel has all the yarn carried over, which makes for a thick padded heel.. himself approves. 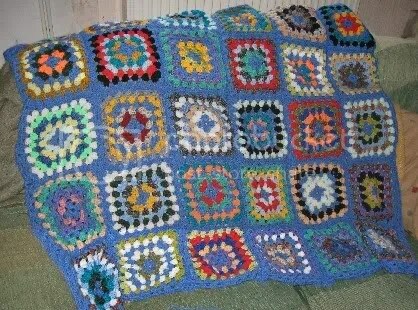 and finally, the granny square blankie I made for my lad.. with mostly blue.. it always has to be blue…. 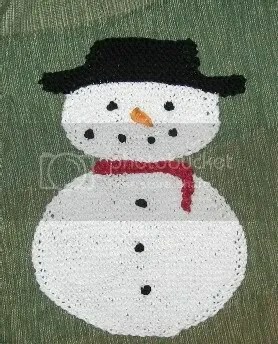 I’m trying to clear some of my knitting projects so I can begin in some things for that winter festival thingy. 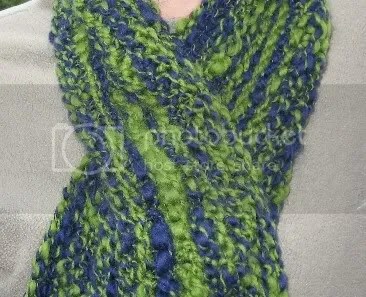 so one of the recent finishes is this merino scarf for himself. We bought the rovings, and he spun it, and I knitted it up using a Moebius pattern. I’m assured its very snuggly. I have to confess we bought the wool without really thinking it through, and I am not entirely sure of its origin. Since then I made the connection between merino and mulesing. Merino is not produced in the UK, most of it comes from New Zealand and Australia. New Zealand have largely phased the practice out, but Australia actually went back on their promise – they had said the practice would be phased out by 2010 – but this year decided they wouldn’t do that after all. We do dock our lambs’ tails – and not everyone agrees to that. However, using the rubber rings really does not seem to cause them any pain. The lambs bound away unconcerned. We do it as a prevention against flystrike, which is the reason given for mulesing. However that is a particularly nasty and painful thing to do to a lamb, it takes them up to four weeks to heal, and if there was any doubt, one quick look at the gory pictures available is enough to convince.. and it is certainly not worth doing for a nice yarn. Given that it is possible to produce merino from countries not practicing mulesing, it does not seem necessary. So I have decided, (wool stash aside) I am no longer going to buy merino, or any yarn, unless I am fairly sure it did not come from sheep that might have had to suffer this mutilation. This won’t be easy.. for example, China buys a lot of wool from Australia, and they export it as yarn to other countries. But really, we should be buying locally anyway, so this will only be the occasional treat purchase. So.. stepping away from the soapbox..